Signum Audio has partnered up with Red Dog Music to create the first Edinburgh Festival of Sound which will take place on the 16th and 17th of November 2018 at Teviot Row House. A showcase of cutting-edge audio technology, installations, workshops, talks, interactivity, and more for people interested in all things audio! Exclusive to pass holders. 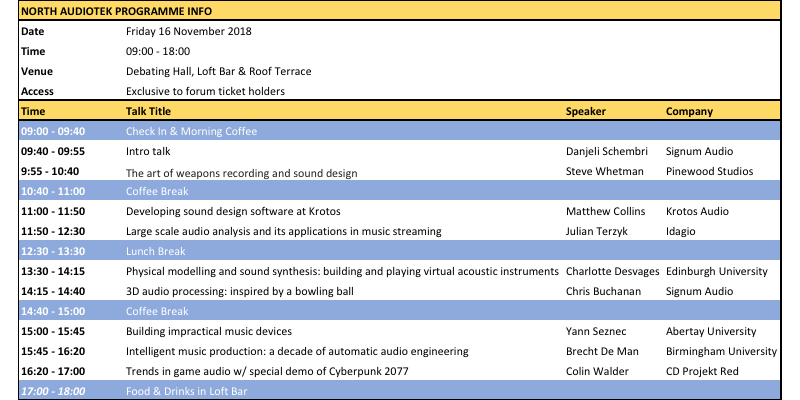 North AudioTEK is a day- long forum hosted by software developers Signum Audio bringing together professionals and students working and studying in gaming, broadcasting, music and academia for a series of talks and idea sharing. There will be talks from thought leaders from Pinewood Studios, Timber 3D, CD Projekt Red (including a special demo of Cyberpunk 2077), Edinburgh University, Abertay University, Brimingham University & Krotos on a diverse range of topics. If you have or are planning to have a career in audio, and you are interested in immersive 3D audio, audio in video games, AI in audio mixing, modular synths and more then this is definitely for you. The forum will take place in the Debating Hall & Loft Bar, and tickets will get you access to the full weekend programme. Please be advised that those with discounted student tickets will be required to show proof of their current student status at the door. 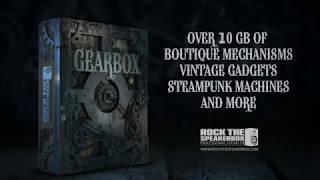 Come and twist some knobs, push buttons and grab some special deals on the latest audio gear. Edinburgh’s music technology specialists, Red Dog Music, have curated a variety of international manufacturers who will be displaying their newest hardware including the likes of Ableton, Sennheiser & Neumann, Roland and Akai, along with interactive sound-based installations you can play with. A programme of workshops, performances and demonstrations is being curated in The Study as well. We will be throwing a party on the Friday night in The Debating Hall. The night will begin with a special demo of Funktion One’s Vero soundsystem at 7:30pm, before we party on into the night. It will feature new Edinburgh-based radio station EH-FM, who will be broadcasting the event live, with more acts to be announced. This is for over 18s and tickets can be bought on the door for £5, or are included with full weekend / forum passes.